This 39-room Jacobean Revival mansion on the shores of Lake Superior is a popular attraction in Duluth. 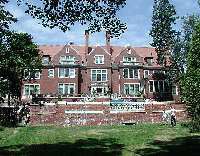 Managed by the University of Minnesota, the Glensheen Mansion is listed on the National Register of Historic Places. The 7.6-acre grounds and carriage house can be explored at leisure, and the lavishly furnished interior of the house is accessible on informative guided tours lasting 60-90 minutes. A new attraction is the nighttime 'flashlight tour', which focuses on the lives of the servants of the house. Be sure to ask the guides about the various ghosts that are said to inhabit the mansion! Opening times: Opening hours vary according to season, check the website for specific dates. Admission: Standard Tour: $15 adults, $9 children 6-12. Other tours and concessions available.